What's going on at work? We want to hear from you. Please come with your questions and concerns. We will update you on where we are with our current meal breaks grievance and if you have any questions/concerns, we want to hear from you. On Oct. 30, our Labor Management Committee met with management and discussed several issues. We believe we were able to have productive conversations that will be helpful for both parties involved. Payroll issues – Nurses having to sign off if a CNA was present or not. It was decided that nurses are to only sign off on what they see/witness. There will be no retaliation for this. Both parties do not want nurses to falsify any documentation. It was communicated to us that this is a timecard issue that applies to all VA’s. There is simply no way around it according to management. Mandatory Ed Day – Nurses need to have this scheduled into their schedule. They otherwise are not able to get it done due to workload demands. Management as told us, if nurses are not able to get the requirements done while at work, to communicate this to the DNS and time will be arranged for help with this. Training on workplace violence – How is this done? There is no formal training as of yet, but management was very receptive to pursuing this in the future. Please contact a Labor Management Committee member for more details about the meeting: Dana Bertran, RN and Renee Clark, RN. 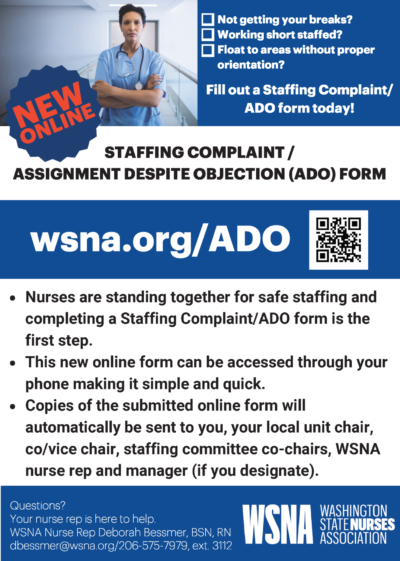 There is still one more open space for a nurse to sit on the Labor Management Committee. If you are interested, please let one of your WSNA local unit officers know! The next Labor Management meeting will be on Jan. 31, 2019 at 11 a.m.
WSNA Nurse Rep Debi Bessmer, BSN, RN will be the WSNA/Walla Walla Veterans Home Representative beginning Nov. 1. Debi comes with experience and years of practice. We know you will all welcome her and together, you will continue to make positive changes for Walla Walla nurses! Questions? Contact WSNA Nurse Representative Jaclyn Perkins at 1 (800) 231-8482, ext. 3118. or at jperkins@wsna.org. Get updated on our current meal breaks grievance and hear about what's going on at the negotiation table for our new contract. When: Wednesday, Aug. 1 from 1:30 to 3 p.m.
We'll also be talking about other current grievances and upcoming events at this meeting. If you have any questions or concerns, bring them! We want to see and hear from you. Questions? 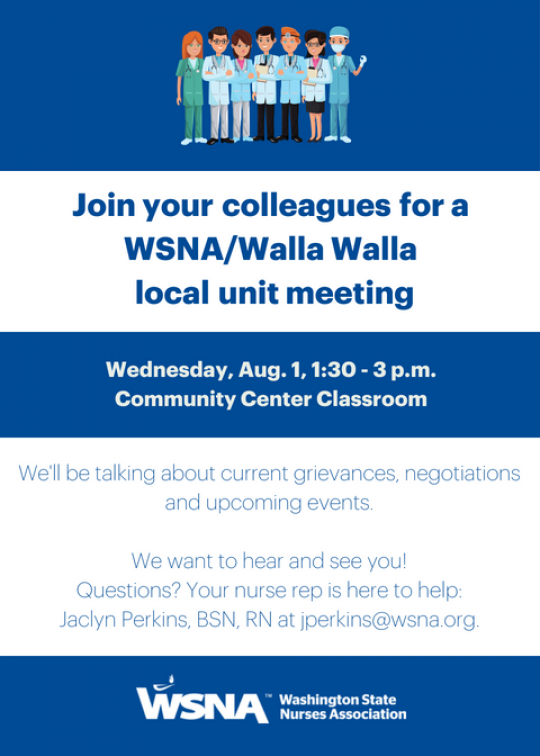 Contact our WSNA nurse representative, Jaclyn Perkins, BSN, RN, at jperkins@wsna.org. Please frequent the WSNA/Walla Walla Veterans Home Local Unit webpage for possible updated communications. Please frequent the WSNA/Walla Walla Veterans Home Local Unit webpage for possible updated communications. If you have any questions, contact WSNA Nurse Representative Jaclyn Perkins at 1-800-231-8482, ext. 3118 or jperkins@wsna.org. National Nurses Week is around the corner! National Nurses Week is around the corner. Note: new location and date. 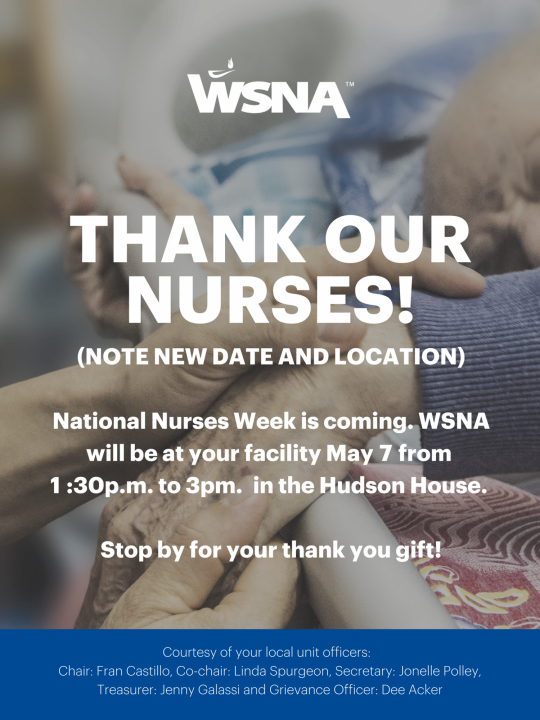 WSNA will be at your facility May 7 from 1- 3 p.m. in the Hudson House.